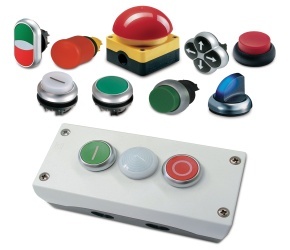 This attractive, functional line of pushbuttons features a space-saving construction that enables fast assembly. The complete illuminated M22 line offers LED light units to ensure high-quality brightness and up to 100,000 hours of illumination. Because of the rugged design of these pushbuttons, most operators and contact blocks exceed five million mechanical operations. NEW!!! Our M22 now offers an attractive chrome metal bezel that will enhance appeal to your 22mm pushbutton applications. This highly versatile line features field-convertible functions and customized laser engraving capabilities. LED indicators offer 100,000 hours of life in high-vibration environments and lenses specifically designed for LED illumination.